Size 8 Disney Frozen Children's Spring/Autumn Pyjamas. This three piece Disney Frozen pyjama set is 100% cotton. 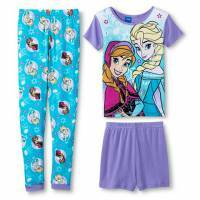 These Disney Frozen pyjamas have a short sleeved top with a Disney Frozen print, round neckline and come with matching lilac short pants, and matching Disney Frozen long print pants. These are great pyjamas for my Disney Frozen Fans. These Disney Frozen Pyjamas are also available in Size 4, Size 6, and Size 10.